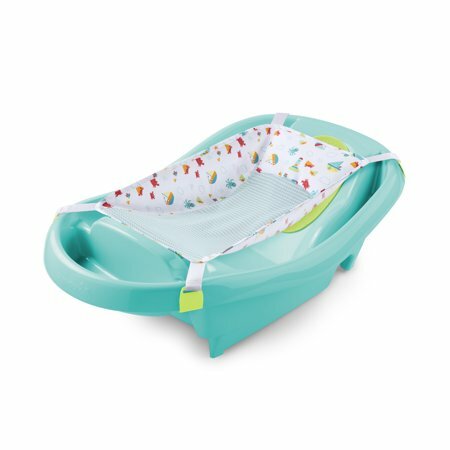 Designed for total comfort and support, the Summer Infant Comfy Clean Deluxe Newborn to Toddler Tub is sure to keep a smile on your little one’s face during bath time. This extra large tub includes a soft fabric sling that gently cradles your baby. As your little one grows, the foam pads and contoured sides and seating areas ensure baby stays safely (and comfortably) in place. Designed for total comfort and support, the Summer Infant Comfy Clean Deluxe Newborn to Toddler Tub is sure to keep a smile on your little one’s face during bath time. This extra large tub includes a soft fabric sling that gently cradles your baby. As your little one grows, the foam pads and contoured sides and seating areas ensure baby stays safely (and comfortably) in place. Extra-large 3-stage tub grows with your baby. This tub is absolutely the cutest and most convenient for our new niece. Works well with my double kitchen sink and was also able to use in my bathroom area with a single sink. The removable sling and soft foam built into the tub kept her secure with no slipping while I was bathing her. The built In drain made it super easy to rinse her off without having to remove her first and definitely saved clean up time with no spills. Sturdy yet lightweight and easily stored does not take up a lot of space. 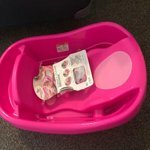 One of the things you don't know the value of when you are preparing for a baby is a good baby tub. I think most people assume that you can wash your baby in the sink, but you honestly cant safely do that until they are old enough to sturdily sit up on their own (which takes about 6 good months in most cases). I love this tub because it transitions from newborn, to infant, to toddler all in one! The net is a great concept, and I used it the first couple times, but I felt like it was getting in the way of washing the babies back. The infant side works perfectly for newborns as well and I was able to gently shift her enough to clean her very well. I love the little compartment on the end that holds your baby wash and wash clothe. When the baby gets older, you turn the tub around and use the other end where there is a backrest that sits straight up. 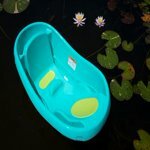 I had the same tub for my son and used it for the first year, but I was pressured to getting rid of it (living with in-laws at the time) once my son could sit in the tub. I regretted it and got another tub that was a pain. I will keep this one until my little one outgrows it because its easy to fill, it saves water, stays clean (I just rinse it out between uses) and makes bath time simple. I definitely recommend! I got this product for my my grand niece she is 9 months old. She is not a big baby. But her cute self will be using this tub for a long time. I don't know How much she love bath. But I know it will last for a while. . I will recommend this product to everyone who anybody who ask. This is a very nice product. Everything about this infant through toddler tub is exactly what you would want in this kind of product. Some friends of ours are having a baby boy in a few months, so I got it for them. I know they will love the beautiful green color, as well as all the safety features. 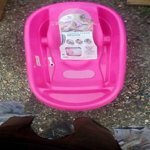 What I really like about this tub is the way parents, or other care takers can use is it up to two years. It has a pad with a sling for an infant, that can be removed as the child grows. 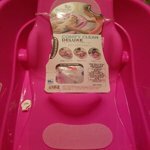 There is a nice spot on the tub to keep the child in place, as well as padding for softness. 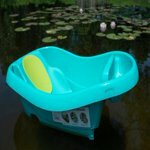 The child can sit in it when they are a toddler, before switching to a regular bathtub. There is a plug at the bottom, to drain the water. This product has a sticker showing it meets all of the safety requirements for infants and toddlers. I feel good about giving this gift to my friends for their new baby! 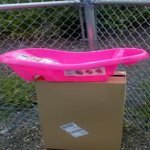 This tub is so cute with its hot pink color and white baby sling. Nice thick plastic molded for comfort. Sling supports baby in tub. White drain plug at bottom. I also use it as a manicure/pedicure tub! 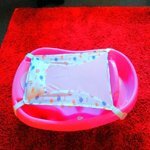 It is the perfect size and you can comfortably rest your limbs at the head or foot. Great quality! 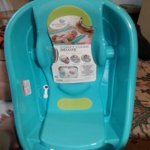 This baby bath tub is very well made with a place to place your soap and feet to place on a counter or place over a sink. 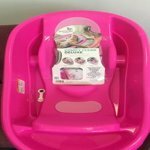 It can fit an newborn, am infant or a toddlers up to 2 years old. 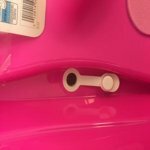 The drain plug is placed off to the side so your child will not have it touching their skin., or accidently drain the water out of it during bath time. It comes complete with a sling to keep baby from sliding. There is a foam head and foot rest to cushion your child. This is a very nice tub and I recommend it to anyone with newborns to toddlers. If you are like me you are not pleased with bathing a baby in the kitchen sink. With this well designed tub this makes bath8ng easy. Soft and adjustable sides to go from new born to toddler! Soft and comfortable for the baby too. Gets a lot of use! This is one of the best items ever. 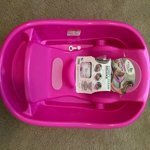 This is a very nice and inexpensive toddler tub. The plastic is very firm, yet soft to the touch. The top surface texture is very nice and non-slip and the added pats make this a very comfortable unit. There is a reservoir at your toddler's feet for wash cloths etc. 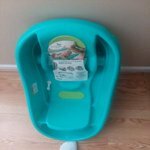 It's very stable and I like the overall size and convenient drain plug so that you can leave that open if you wish and rinse your little one while allowing the water to drain right down and out. The groove underneath fits perfectly over our kitchen sink rim and helps to keep the tub in place. Our 9 month old grandson seemed perfectly comfortable in it. I did not try out the newborn sling which is included, but it also seems nicely made and practical with a little bit of padding around the edges with a mesh that allows water to run through. Putting it sideways in a double sink seemed to work best. I do like it and found that all of the edges are nicely contoured with smooth edges that are nicely rounded off. Definitely recommend this tub! 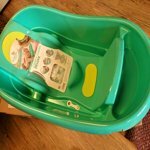 This is an adaptable (3 stage) tub, it grows with your child and saves money! I really like how you can use it in a single or double sink and adult bath tub. It has a rounded notch at the bottom so you can firmly place it on the double sink divide. It has rounded corners, safety first. Another favorite of mine is the separate but attached area for baby's soap, shampoo and conditioner. So, no reaching and definitely not leaving your baby. It also comes with a sweet and purposeful sling with a very soft head rest. It is machine wash, delicate cool. The sling is useful so it can lessen baby's movement too. On the very bottom it does have a pull plug to empty the water. 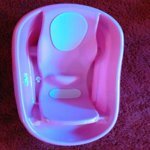 Later as your child grows the bath itself has foam pads and is contoured for comfort and safeness. It is very spacious! Maybe, the only thing I would add and that's if you don't have it already is a non-skid mat if you use the adult tub. This newborn to toddler tub is fairly standard. The first thing that caught my attention was that the inside middle part of the tub has a different plastic feeling versus the shiny plastic on the rim and outside of the tub. 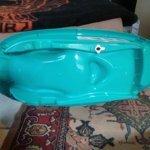 The different plastic feeling gives the tub more of a slip resistance, which I like. The stock ad photo makes the pink version of the tub look like it is soft pink in color, but it is a very bright, hot pink. I had some trouble getting the bathing sling on. The sling and clips almost seemed like they were too small and short to fit into the clip grooves on the tub. Once I finally got them in place, I noticed that the sling was very taut. I assume this is for safety reasons to keep the newborn above most of the water, but with how taut it is, it seems like the baby wouldn't be in water at all. I really like the print of the sling.